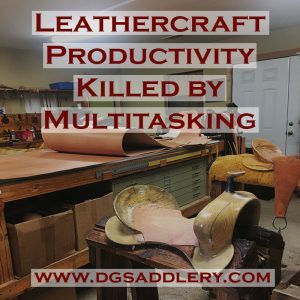 Are you under the impression that having multiple jobs or projects going at one time is more efficient for your leathercraft productivity than focusing on one one project at a time? Have you been told and/or taught that it’s better to cut out all your jobs for the week or month at one time and get them all going? Are you finding at the end of the week or that month that you haven’t finished anything? But you have 47 things started! I use to be this way, and oftentimes still am. Truthfully, I still fight this battle everyday. For years we have been told that multitasking is a skill that the best and most efficient Craftsmen do. This is what makes them successful and productive. Multitasking is not as efficient as people once thought. With the work that we do as LeatherHeads, there is an advantage to setting up our work days so that we are working on multiple jobs everyday. This gets out of hand when we have so many in the queue that we begin to lose track of where we are in the process. Having a saddle or two going at one time is a great way to make use of the down time that comes up in the process. Many steps of a saddle build require parts to dry or glue to set up, allowing you the opportunity to work on the second saddle. This fills those gaps nicely. Leathercraft productivity also benefits from working in a couple small jobs to fill empty spots in the shop time for that day. These can be a convenient break from saddle work and can help to break the flow a bit to allow a difference in creativity. Where this becomes a problem is when we assume that if this works well, then even more projects going will make you that much more productive and creative. There is a limit to this and at a point it becomes counter intuitive. Are Your Leathercraft Jobs Assets or a Liabilities? There is a big difference between being busy and being productive in the workshop. I have spent countless hours, days and weeks in my shop staying extremely busy. I spent time cutting parts for all the jobs that I had on a list. Organizing my hardware. Prepping parts for tooling. Doing all kinds of things that, in the moment, felt really productive. It is very easy for us to spend time doing things to move a huge group of jobs forward, even if only slightly. We spread our energy and resources too thin and lengthen the time frame from starting the job to completion. We are trying to do too many jobs at once. The goal of any shop is to generate a profit with the resources that we have. And we want to generate this profit on a consistent basis. If you are constantly adding new jobs to the queue then you are increasing the demand on resources (leather, time and money). This will mean that you have less time available for each individual job in a one day period. Completing a job is the goal. Starting a job is only one step. The shop has not benefited from a job being started if the job has been started but stays in the queue for 4 weeks. There are a lot of things that can happen when you have too many jobs started in the shop. Something could spill and destroy the work that you have already done. You could commit leather to something that you can’t finish in a short period of time and could have used that material in another area better. The customer could change their mind on the job and back out. Each job that is in the queue has potential to make you money or cost you money. You should view each job started as such and take great care to get them out of this state of liability as quickly as possible. Finish something everyday… even if it is tiny. To improve my leathercraft productivity, I try to use the rule that everyday I should finish something. For small custom projects I try to coordinate them so that every day I am finishing something. Not all projects can be built in one day. So I try to set my schedule up so that every day something is in the final stage and can be completed. When it comes to bigger projects like saddles, this is much more difficult. My goal here is to try and finish a section of a “phase” in my saddle workflow or ideally an entire phase. But the main idea here is that the goal for a single day should be when you walk out of your shop you have something on the done rack. Even if it is just a knife sheath or a wallet. The size of the job isn’t as important as forming the habit of crossing one job off your to do list each and everyday. One job completed today is one less to deal with tomorrow. There is something that happens to your energy level and your satisfaction with your Craft when you are crossing even one job off your list. You feel accomplished and your shop seems prolific and efficient. Our brains do not have the ability to manage multiple tasks at one time. I am sorry if you fancy yourself as a “Multitasking Guru”… YOU ARE NOT. This is especially true in the creative works that we perform. When we have 47 jobs started and going in our shop, it is almost impossible to focus any of our creative powers onto these jobs. Our minds are cluttered with too many thoughts, tasks, and analytical management of resources that we get into a state of fog as we work. If you really take a moment to be honest with yourself, you will admit that during these moments your leathercraft productivity suffers creatively. Instead, taking each job individually will allow us to focus our creativity on the moment and the job at hand. This ensures that your creative mojo is hyper focused. Trying to do this while your mind is also worried about the other 46 jobs cluttering your workshop is not a creatively nurturing experience. I have found this particularly true during the Christmas seasons of our shop’s past. We usually had little choice but to try and operate multiple jobs at one time to insure timely delivery. Having limited time as the deadline looms, we tend to “short tool” projects. Design patterns that are easier and faster to tool. We may go the easier route in the construction. Simply to complete the job and move on to the next one. The projects created during these times are not our most creative works. This is proof that we are NOT doing our “best work under pressure.” I always thought I did my best work under pressure as well… looking back, I am not as “crafty” as I thought. 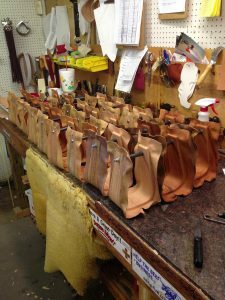 Improving your leathercraft productivity starts with what you are finishing. Orders you are taking or getting started on affect your business revenue little. We can really make an impact on our business by simply making it a goal to finish something everyday. It is normal in our industry for craftsmen to be very proud of how far behind they are. As if this orders sitting in a folder of “to dos” really adds substance to their bottom line. These orders lie in waiting with the potential to improve revenues. Until they are taken to completion, they have zero effect on the financial wellness of the business. Take the time today to go through your stack of orders. Organize them into categories based on shop time needed to complete each one individually. You will end up with orders that may take a couple hours, a full day, or that may take a week to complete. Look at these shorter time framed orders. Commit to putting at least one of these on your schedule to finish every day for two weeks. See how your shop is doing financially as well as how you feel emotionally and productivity wise. You will feel much more productive in your shop overall. Now there is a sense of consistent accomplishment found in your business that you have only felt on occasion before. 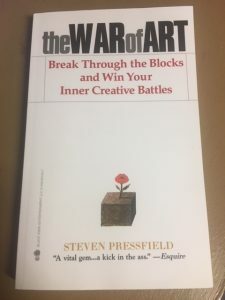 I have another book review this week and if you are interested in Daily Rituals then this book is for you. Have you ever wondered how artists work? What routines and disciplines do successful artists put into place to insure that they are as productive as they can be each and every day? 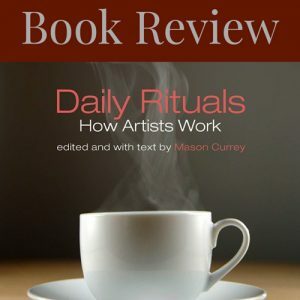 In “Daily Rituals” by Mason Currey, he catalogs the daily routines and rituals of many successful artists from past and present. We get a glimpse into their lives and how they maintained a consistent and productive work schedule despite the pressures of normal daily life. I have to be honest, I have listened to this book probably six times on Audible while working in my shop. I tend to listen to a lot of books during the workday. I get bored easily just listening to music, so Audible is a very important part of my sanity throughout the hours and hours of working alone in the shop tapping away on leather.